Limitless is the signature fundraiser for iSpeak Now. 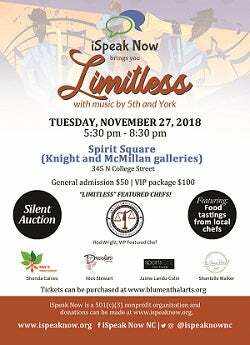 In addition to live music by 5th and York, a silent auction featuring amazing items, and showcasing our programs through our Student Ambassadors, Limitless also features five local chefs that will provide tastings of their signature dishes. iSpeak Now instills passion, pride, and confidence in children and young adults so that they recognize their future is limitless! We do this through the Mock Trial Experience (MTE), The Advanced MTE, Nzuri, iWrite, the Secret Storyteller project, iSpeak TV and the Jumpsuits to Suits Initiative. We provide mutually positive and interactive learning environments for children and young adults.